On October 8, 2007, the Enso String Quartet performed two educational concerts for the San Antonio Chamber Music Society. In the morning they played at the Cyndi Krier Correctional Facility which is a detention center for adolescents who are serving terms. The center is a proactive facility where children take core curriculum classes and are also taught positive living styles. The average stay is 11 months. There were two pregnant girls. The children walked into the gym, hands behind backs. They wore khakis and polo shirts. The youthful vibrancy of the Enso Quartet made them effective role models for the inmates who sat on the gymnasium floor in rows right next to the quartet. The quartet played a slow movement of a Haydn quartet that was reflective, a Ginastera quartet that was jazzy, and a movement of the Ravel quartet which had a lot of unusual pizzicato effects. I saw one girl in the front row smile in surprise and delight when the quartet began the Ginastera. Then she kept looking at her friends seeming a bit embarrassed that she couldn’t help responding to the music. I find it fascinating that music can elicit an emotional response in even the most skeptical audience. The Enso invited questions from the children. Many asked about the body movement, seeming to be mystified that it was not a choreographed part of the performance – that it was in fact unconscious and spontaneous. All present were particularly taken by the question of one young boy who asked the group if they were ‘deep’. Luckily second violinist John Marcus was cool enough to understand the lingo. He responded ‘do you mean tight’? ‘Yes’, the child answered. He was asking if the quartet members were close friends. 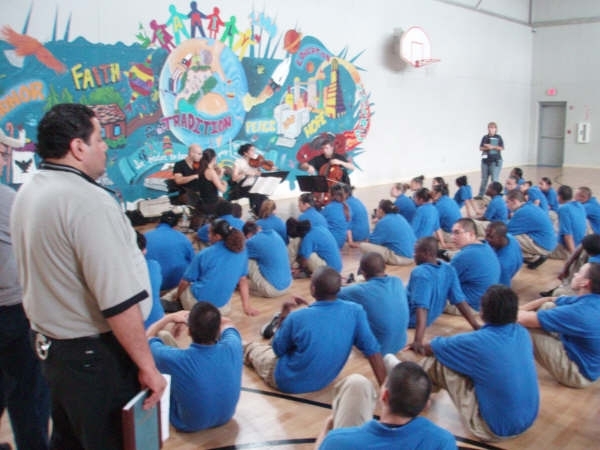 In the afternoon the Enso did a repeat performance at the Juvenile Detention Center. The children here are waiting to be sentenced. They are less comfortable with their environment, not yet used to the system. You can see from the photos that they are wearing prison garb. We have received positive feedback from Chaplain Alvin Logan at JDC and Roy Washington at Cyndi Krier Correctional Facility that these events are effective and make an impression on these incarcerated young people. The San Antonio Chamber Music Society is committed to repeating events at these facilities when possible. Our next two outreach events will be performed by the Orion Quartet on February 18 at MacArthur High School and Churchill High School.